Amblyopia, or commonly known as lazy eye, is decreased vision in one or both eyes due to abnormal development of vision in infancy or childhood. Such abnormal development of vision occurs because nerve pathways between the brain and the eye aren’t properly stimulated, resulting the brain favours the good eye over the other (the bad eye). Amblyopia usually developed when one eye only sees blurry images. 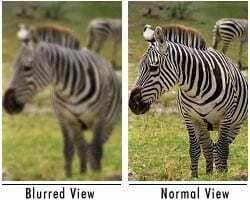 As children typically developing their vision centre in their brain as they grew, such blurry images obstruct the normal visual development causing vision to decrease despite the normal appearance of the structures of the eyes. Constant strabismus or crossed eyes - the brain will take up the images seen in the fixated eye and suppress the misaligned eye, leading to amblyopia. How can I know whether my child has amblyopia? The easiest way is to bring him or her to the optometrist to have a complete vision test before school age to screen for any significant refractive error and eye misalignment even there is no vision compliant because in most cases, a child may not experience blurry vision if only one eye is bad. Therefore, amblyopia may develop unnoticed. Making mistakes while copying notes from the blackboard. These may indicate blurry distance vision that may need immediate attention. For more information on eye health and eye conditions or to find your local Eyeplus Optometrist, click HERE.